Bangladesh born guitarist Reza Khan does not view himself or call himself a citizen of the world, he lives the citizen of the world. He worked for the UN from Asia to Angola, performed music and started a family in South Africa, before he finally settled in New York. The album takes off with Drop of Faith, an emotional song with world music flavor whose special highlight is the melodic interplay between Nils on electric guitar and Reza on acoustic guitar. Gathering is the apt title for the next stunning collaboration between guitarist Khan and the energetic saxophonist Jeff Kashiwa. Due to the reverb effect Reza's guitar playing gets an atmosphere of width. Clear Skies caresses the ear with selected sweet-sounding instruments, which unite with their impetus to the common mission, to carry the melody in the most pleasing way to the inclined listener. The title It's About Time is often used by artists who take a long time to come up with a new album. In the concrete case it concerns rather the spectator, who has the first contact to Reza and experiences a revelation of the special kind. Those who mock themselves about the breathing on Beyond the Trees should be told, that it contributes like an instrument to the atmospheric flair of the piece. The Latin flavored piece shows wonderful moments of intimacy. Zero Tolerance is a title that could be misinterpreted, perhaps the composer means those towards himself. The treatment of the Hammond Melodion by Saisse, which is not used so often, is notable. In the course of the album this drifts strongly in the direction of world music like on Club 368. On Plutonik an abundance of different keyboard sounds by Philippe Saisse lay the foundation for Reza's musical synthesis of folklores on acoustic and electric guitar. Mark Egan introduces into The Way with his sonorous sounding fretless bass before Reza guides on guitar the direction in new heights. Philippe delivers on accordion colorful impressions of world music. Cloud 9 is a lovingly built guitar piece, which comes up with a variety of instruments, developing the musical elements with great richness in detail. We owe it to Philippe's accordion and Reza's guitar that Under The Moon also writes romance on its banner. Hidden in Reza's biography he mentions guitarist Pat Metheny as one of his dominant influences. Next Train Home shows this influence in certain micro-elements even though Reza is more down-to-earth and melodically inclined. 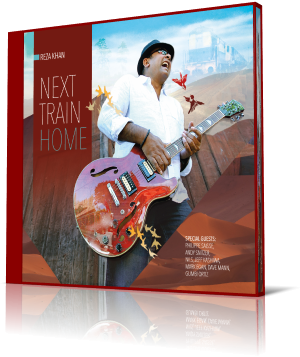 In view of the highly talented musicians involved, Reza Khan's Next Train Home convinces with its musical diversity and prowess. This melodic gem, however, is not oriented to today's modern zeitgeist and mass tastes, so it's time to get it before this album disappears from the charts.